Caused by: infection with one of the following parasites: Babesia microti, B. divergens, B. duncani (WA-1), MO-1 (unnamed strain), most often transmitted through the bite of the blacklegged tick (or deer tick, Ixodes scapularis) in the nymph stage (when it is about the size of a poppy seed). The infection can also be transmitted through transfusion with contaminated blood and from an infected mother to her baby during pregnancy or delivery. A nymphal stage Ixodes scapularis tick (approximately the size of a poppy seed) is shown here on the back of a penny. Credit: G. Hickling, University of Tennessee. Symptoms of infection: Many people are asymptomatic. Symptoms include fever, chills, sweats, headache, body aches, loss of appetite, nausea, and fatigue. Some develop hemolytic anemia, which causes jaundice and dark urine. Long-term effects/complications: a low and unstable blood pressure; altered mental status; severe hemolytic anemia (hemolysis); a very low platelet count (thrombocytopenia); disseminated intravascular coagulation (also known as “DIC” or consumptive coagulopathy), which can lead to blood clots and bleeding; malfunction of vital organs (such as the kidneys, liver, lungs, and heart); or death. Babesia is more likely to be life-threatening in people without a spleen (or without normally-functioning spleen); people with weak immune systems (due to cancer, lymphoma, AIDS, etc. ); people with other serious health conditions (such as liver or kidney disease); and the elderly. 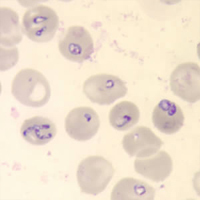 Babesia parasites in red blood cells on a stained blood smear. (CDC Photo: DPDx). Via CDC.gov. In patients with acute infection, routine lab testing may show hemolytic anemia and thrombocytopenia; proteinuria, hemoglobinuria; and elevated levels of liver enzymes, blood urea nitrogen, and creatinine. Antibody detection by serologic testing (such as WA1 IgG Antibody IFA and Babesia microti ABS IgG/IgM): This kind of testing is species specific, so if the test is for B. microti and you have B. duncani (WA1) or one of the other species, it will come out negative. Here is the CDC’s recommended treatment schedule. Notice that both drugs are taken every day for 7-10 days. *Treatment with atovaquone (Mepron) is not recommended for children or for women who are pregnant or lactating. Even though Babesia infection is known to be transmitted through blood transfusion (As of Sept. 2011, the CDC has identified 159 cases, and at least 12 of those people have died. ), donated blood is not tested for Babesia! Donors are asked to fill out a questionnaire asking whether they have Babesia. In other words, we are relying on patient self-reporting to screen the blood supply for this parasite! The CDC’s response as to whether they will implement testing of donated blood for Babesia in the future: Maybe. 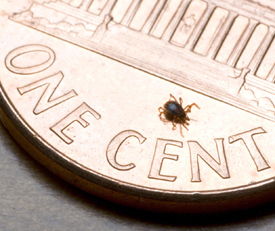 They say there are going to “Monitor reports of tick-borne infection to determine if the disease is spreading to other parts of the country and to identify emerging strains of Babesia that may cause human disease.” In other words, they’re going to wait to see how bad it gets before they do anything about the blood supply. Some organizations like the Rhode Island Blood Center have begun screening blood for Babesia using an experimental test, but this is not mandated by CDC policy. Babesia can also be confused with Malaria when blood is examined microscopically, so Babesia cases in areas where Malaria is common are likely to be misdiagnosed and thus underreported. Want to read more about Babesia? Visit the CDC’s info page.